Photo Caption: Berkeley College has been named to the Military Times Best 2018 list. In the Berkeley College Veterans Resource Centers, veteran students get the information they need about programs and issues pertaining to them. 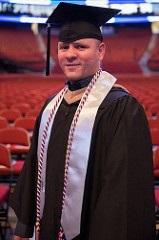 Pictured above is Jose Pagan, who served eight years in the U.S. Army, during the Berkeley College 2017 Commencement ceremony. Berkeley College has been named to the Military Times Best list for the fifth consecutive year. This recognition ranks Berkeley College among institutions that go above and beyond in providing academic and personal support for veterans pursuing a college degree. According to the Military Times, more than 600 colleges took part in this year’s detailed survey with fewer than half qualifying for this ranking. Military Times’ annual Best Colleges survey asks colleges and universities to document a large array of services, special rules, accommodations and financial incentives offered to students with military ties; and to describe many aspects of veteran culture on a campus. Military Times also factors in data from the Veterans Affairs and Defense departments, as well as three Education Department sources: the IPEDS Data Center, College Scorecard data and the Cohort Default Rate Database. For the full Military Times Best: Colleges 2018 rankings, click here. “It is an honor for Berkeley College to be recognized once again for our commitment to veterans and military students,” said Edward Dennis, Assistant Vice President, Office of Military and Veterans Affairs. “We’re proud of the fact that we have on-site Veterans Resource Centers – at the New York locations in Midtown Manhattan and Brooklyn and at the New Jersey locations in Dover, Newark, Woodbridge and Woodland Park – and an Online Veterans Resource Center – that have enabled us to reach a greater number of veteran students, including those stationed overseas,” he added. The Veterans Resource Centers provide a location for veterans to receive information about their U.S. Department of Veterans Affairs (VA) benefits. Here veteran students can meet with representatives from the College’s Office of Military and Veterans Affairs, socialize with other veterans, and obtain information about programs pertaining to military and veteran students. Berkeley College supports the G.I. Bill and Yellow Ribbon Program, and collaborates on national ventures with the National Guard, the Army and the Air Force, the GoArmyEd distance learning program, and the Navy College Program Distance Learning Partnership. Skyla is an emotional support dog in training who joined the OMVA staff to assist veterans who suffer from post-traumatic stress disorder, anxiety, and depression or panic attacks. Berkeley College students and staff participate in the Veterans History Project sponsored by the Library of Congress. In 2000, the United States Congress established the Veterans History Project in order to collect, preserve and archive personal accounts of American service members so that future generations will be able to hear directly from the veterans and better understand the realities of war. The Berkeley College OMVA staff have created the Veterans and Goldstar Reflections projects with student-veterans and families of veterans. These projects create a gallery of photos that contrast their lives before and after their respective service experience in one picture. Berkeley College is home to a student-veteran-led Veterans Club affiliated with the Student Veterans of America (SVA). For more information about the Office of Military and Veterans Affairs at Berkeley College, click here.